I’ve seen a lot of good reviews on the Burgundy Times Tine palette, but decided to skip it for now as I already have my Modern Renaissance and Holy Grail to cover that ground. Surprisingly I don’t have any navy, grey or similar cool tone shades so I decided to buy Navy Times Nine, and added Amber Times Nine as it looked as appealing as the former. 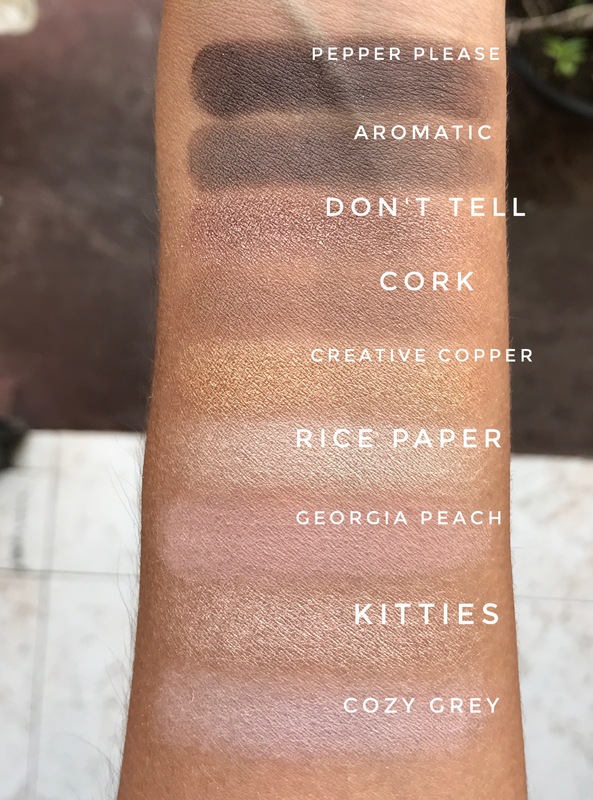 TBH I swatched Amber Times Nine about a year ago at the MAC store and did not like it at all because it was very patchy and dry. Nevertheless I thought I’d take the risk and try it one more time, and I’m glad I did. You can actually put this in your pocket (not your super fitted jeans) The size of a pan is like a medium size coin, and there are nine shades welled into a no-nonsense black plastic container with clear lid and magnetic closure. Cozy Grey (M) Described as cool grey, but it’s a very pale beige-y grey, super buttery with good pigmentation. Kitties (F) Described as pale bronze, but it’s a gorgeous champagne shade with soft velvet-like shimmer. Georgia Peach (M) Stays true to the description by MAC, this is a beautiful dirty rose pink and it glides and blends like but-tah! Ricepaper (F) Described as peachy gold with shimmer, I think this is a toned down version of Kitties. I can understand why everyone is head-over-heels for this shadow. It’s so pretty! Creative Copper (L) Described as a light beige, (are people at MAC blind?) this is actually a beautiful gold (neither beige nor copper!) with a neutral undertone. Cork (S) Another shade that stays true to MAC’s description, this is a muted golden brown in satin finish. Another highly appraised shade and now I know why! It’s a universally flattering and very versatile shade that you can throw on your crease and be good to go! Don’t Tell (L) Described as sparkly brown, this is the only shade that was a bit dry on the palette. It doesn’t come off the pan easily, and it’s a coppery brown with a hint of rose gold. I wish the colour pay-off as as same as others because you need to work hard on this shade. Aromatic (M) Described as matte brown, it’s a deep cool-toned brown with very good pigmentation. Pepper Please (V) Described as sparkly bronze copper brown, this was also a tad bit drier, but better than Don’t Tell. It’s base is pretty similar to Aromatic, but the coppery sparkles add a bit of understated drama to this otherwise plain-jane shade. 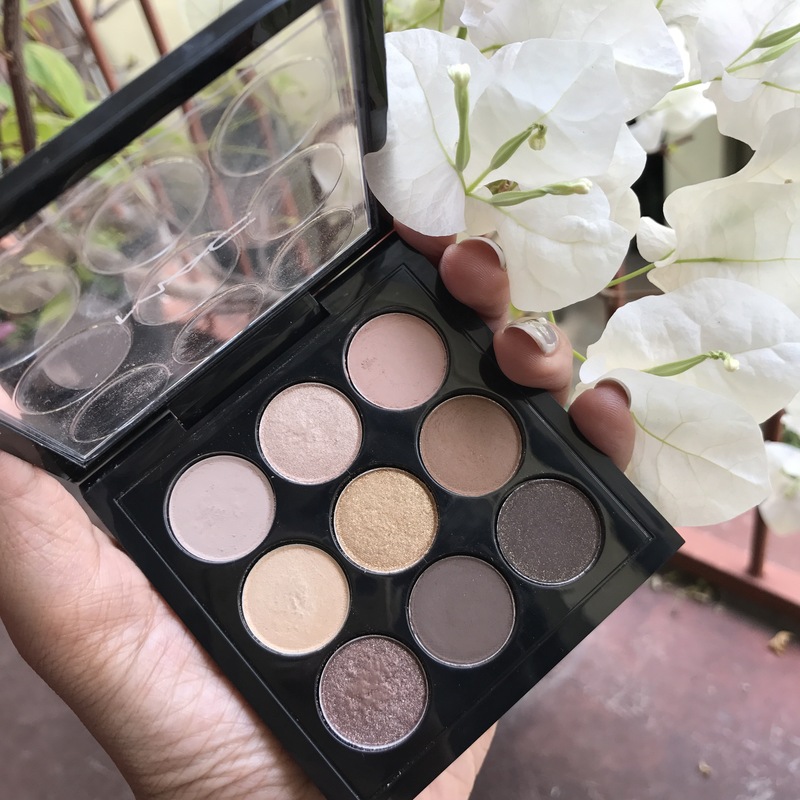 The quality of these shadows are: So far the best I’ve experienced with MAC shadows. It’s very similar to Mariah’s I’m That Chic You Like palette. Shade selection: Is pretty good in my opinion. You have a healthy mix of mattes and shimmers, cool and warm tones and the colours are great for all skin tones. Overall thoughts: I think this is a good investment for anyone (makeup artist or not) who travels a lot (as it is literally pocket size) and who doesn’t already have these shades. I do have a few similar shades but the quality of these give them priority, and I’m so happy with my purchase! I’ll be reviewing Navy Times Nine soon stay tuned!